Our office locations are only a few minutes from beautiful Camarillo, California. -Located in the building next to Eggs ‘N’ Things. -Between Oxnard Blvd. & A St.
Dr. Leroy Carson and Dr. Derek Carson are experts in dental care with over 60 years of combined experience. Our Camarillo office is located on E. Daily Avenue and can be found in between the offices of Best In Show Realty and Too Good To Be Healthy Juice Bar. Our Camarillo & Oxnard locations are fully equipped with digital x-ray technology and an in house lab technician, allowing us to craft you a beautiful smile within just minutes of entering our practice. Both of our dentists are certified in IV & IM Sedation which allowing us to offer a pleasant & smooth dental experience for our patients. Since 1970, we have provided the residents of Camarillo and Ventura County with the best quality dental care for people of all ages. With services ranging from Orthodontics to Dental Crowns, our offices and dental staff are equipped with the technology and experience to fit any dental emergency or issue. Our goal has always been to provide painless, excellent quality care for teeth and give you the tools and knowledge to maintain a bright smile that can be admired for a lifetime. If you’re looking for highly trained Camarillo Dentists with decades of experience in caring for teeth, then call us today at Carson & Carson, DDS for a team that you can trust with your teeth. To learn more about our process, pricing, or to discuss which treatments may be right for you, call us today at 1-805-983-0717. 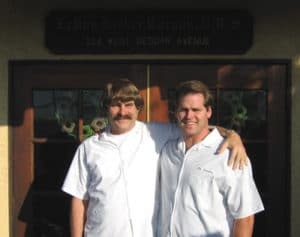 Find out why we’re one of the best dental offices in all of Camarillo and Ventura County today! Check out our reviews page and read about the quality you can expect to receive when being treated by the best dentists in Ventura County. I have had a lot of procedures including 8 implants. There is no better dentist office than Carson and Carson. Dr. Derek Carson (the son of Dr. Leroy Carson) is FANTASTIC! He has learned well from his father (who still works there). Papa is the MAN!, and has been for years. Insane amount of knowledge. The Doctors are THE BEST! The support staff is fun and professional always. I will never go anywhere else. A dentist that truly understands how much the whole dental trip petrifies me - and helps me overcome it. For the first time, and certainly not the last, he used nitros oxide and I can honestly say I can look at future visits without abject terror. No more waiting until the tooth needs pulled! I may even get my teeth cleaned. The BEST dental office in Ventura County!! Super friendly staff, easy to schedule appts, no issues with insurance processing, and Dr. Carson makes sure you are always comfortable and pain-free when getting any work done. I've been a patient for over 7 years now and I couldn't be happier! I highly recommend! Fun, friendly staff, that makes you feel comfortable immediately and accommodating...excellent work, i highly recommend'em. Dr. Derek, you have a hand and a heart of gold. That spirit of help that you have is praiseworthy. I'm amazed at all the treatment you've done and I feel no pain after, not even the pain of the anesthesia sting, I say with propriety because I am very sensitive to pain. Congratulations on your work that loves what you do so you have been successful, not counting on your last generation machine that I do not know how to explain. Much gratitude, you're the best. Today I had a procedure wisdoms teeth extracted with Dr Derek Carson. All staff it was the kindest people ever they stayed room and for the all time asking how I was feeling. The Dr was absolutely amazing! I had several shots and no leave one I feel it and about the extraction when I was thinking he will start it he ready did the extraction out me feeling any pain absolutely any discomfort. I had rest of my day as a normal day and not swallowing.I really want to thank you Dr Derek Carson to be an amazing Dentist so gentle and very professional with absolutely confidentiality.I highly recommended this office if you need to visit just for your regular cleaning or any procedure. Thank you very much!